This container serves as a briefcase. 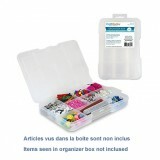 Its size is ideal for inserting all the necessary basic mate..
Transparent container for the organization of any kind. Store and carry your belongings easily and..
Set of brushes to meet the needs of novice artists. The difference in size of the round brushes ma..
Set of brushes to meet the needs of novice artists. The difference in size of the flat brushes mak..